CMMS work order software tips and shortcuts add consistency to work order creation and speed up or automate work order management. NOTE: It is very important to understand that internally these status definitions are tracked as a numeric value by the database. For the purposes of the CMMS user these statuses' text may be changed. This makes sense because MaintSmart is translatable into any language. These fields do not have to be translated though the translator module though and may simply be changed to display a different text value very easily from the work orders options menu. For example 'Done' may be changed to 'Completed' if the users prefers. Internally though the software still interprets this as a closed work order. 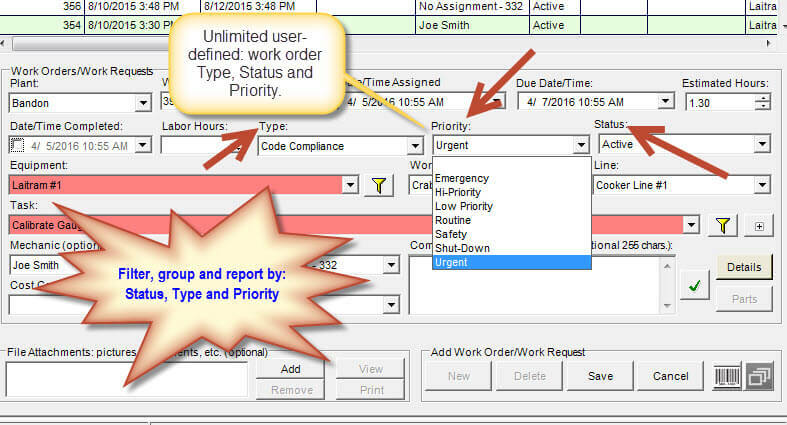 There is a built-in work order status change logging capability in MaintSmart. This is useful if reporting on movement of a work order through the system to completion. Each time the status of the work order is changes this change is logged. 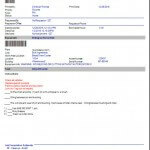 A formatted report is available for groups of work orders, specific equipment or specific work orders. The work order status change log report (like all detailed reports) export to several useful format including Adobe Acrobat, MS Word, MS Excel. 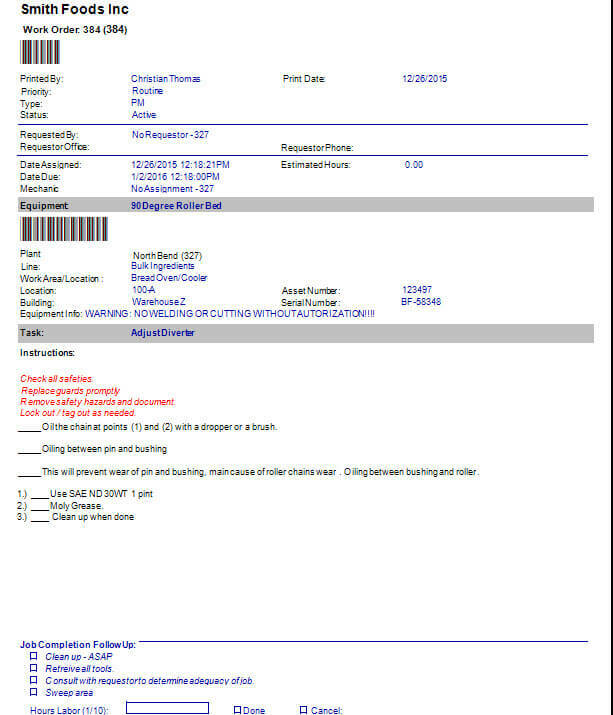 Additionally these reports may be emailed, saved of printed directly from the report print preview screen. There are three (3) date fields in the work order module. 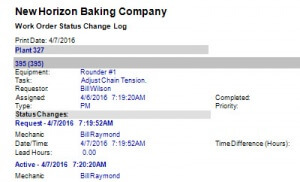 Due Date/Time may be auto-populated based upon the Flag Days Late setting found under the Flags menu item. The purpose of this setting is two-fold. Colors the rows in the work order module that exceed [Date Assigned] + [Flag Days Late] (count of days to elapse when considering a work order to be late). Populates the Due Date/Time field. Additionally the Estimated Hours field may auto-calculate and auto-populate based upon [Date Assigned] + [historical time to complete based upon equipment and task]. This is useful and gives an average of all the times that this particular task has been performed on this specific equipment item. 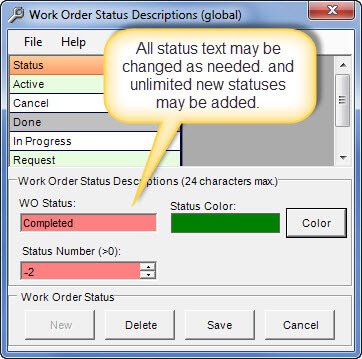 The CMMS work order software module comments field is a text field that accommodates up to 255 characters. This is field is useful for fairly short comments pertaining to work assigned or may be used as work completion comments from the technician that performed the work. This field displays in many of the analysis data grids and therefore may be printed in analysis reports if needed. In many cases large text content is needed to fully describe the task, SOPs, safety instructions, etc. The Details field may contain up to 2 GB of text data per work order. Two (2) gigabytes of printed details is virtually unlimited text and this limit could never be reached. The There are several useful ways to populate the Details field. Drag and drop the text from a manual, web page or other document. Open saved Rich Text Format (.rtf) documents directly into the Details screen. The last option above works in reverse too, the maintenance manager may save whatever text is in the Details screen directly to a MS Word-friendly Rich Text Format (.rtf) document. This is very useful because by saving these documents on a server that is available to all CMMS users these documents now provide a simple way for anyone to populate detailed instructions in a consistent way with almost no effort. 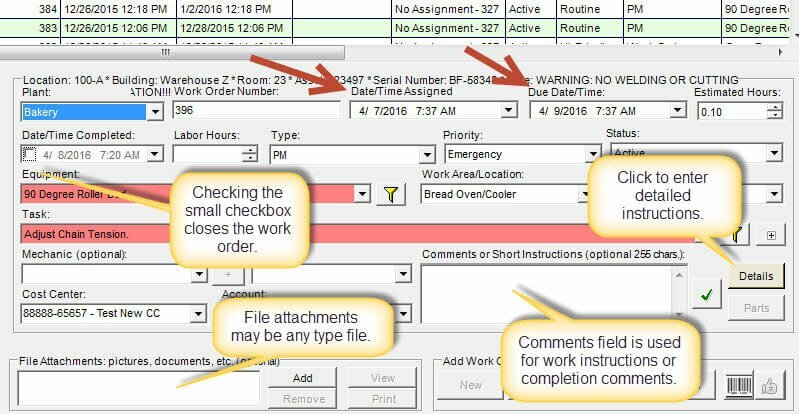 Tip: Many MaintSmart users will drag/drop or copy/paste actual preventive maintenance task lists from the OEM user manual directly into the work order software module details. It doesn't get much easier that this! There are several different work order formats to choose from. This setting is accessed from the work order software module menu: Options>>Work Order Format>>??. Next installment covers more work order software module time-saving tips. Contact us for personalized training on this topic. Thanks for sharing this. It’s good to know how software like this works and see if it would be a good fit for your business. Seems like this has a lot of good features!